I'm a bit of a casserole queen, I love to cook everything in one pot if I can and I like to make a couple of casseroles on a Sunday so that I have something in the fridge that just needs heated up when you get home. Casseroles often taste better reheated anyway. I always go for fresh green veg and Savoy Cabbage is really nice just now, just a couple of minutes in boiling water and it keeps it lovely fresh greenness and a little bit of bite, lots of black pepper and the meal is made. 1 medium leek, trimmed rinsed and sliced. 1. Place the pearl barley ina large saucepan; cover with cold water. Bring to the boil; drain; rinse thoroughly under cold running water. Return the pearl barley to the pan; cover with fresh water. Gently simmer for 20 minutes; drain. 2. Preheat oven to 170C/Fan 150C/Gas Mark 3. Whilst the barley is simmering, heat 1 tbsp oil in a frying pan; add the carrots, fry for 4-5 mins until browned. Transfer to a casserole dish using a slotted spoon. Add the leek and mushrooms to the frying pan; fry for 3-4 mintues. Transfer to the casserole dish. 3. Add the remaining oil to the frying pan. Add the chicken quarters; fry for 8 mins, turning once until golden all over. Transfer to the casserole. Stir the tomato puree into the chicken stock. Pour over the chiken and vegtables. Stir in the barley and thyme. Season. 4. Cover the casserole with a tight-fitting lid. Bake for 1 hour until the chicken is cooked through and the vegetables are tender. Garnish with parsley. Serve with Granary Bread. So that is the recipe, however, to reduce the fat I actually browned the chicken in a non-stick pan with no extra oil, then cooked the carrots, leeks and mushrooms in the juices from the chicken - and it was delicious, less oily and less fat. You may have noticed that a previous recipe came from the same magazine. I have a large collection of Bella Cookbook magazines. 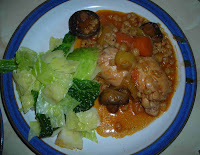 It had great family food, basics and challenging recipes, I was very sorry when it was discontinued.